I was kind of expecting this to be funnier than the show (which I’ve never seen, but am familiar with through homage), but I didn’t know when I first selected Dragnet that it’s intended to be a parody. 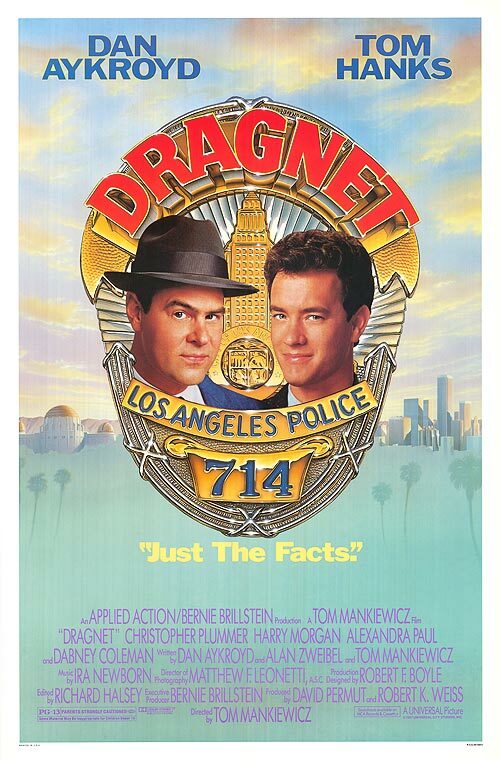 Maybe if I was a fan of the original show I’d be worried, but Dragnet plays to parody so well I see a lot of potential to be the definitive parody (displacing the Stan Freberg audio sketches). This movie seems to afford an increasingly rare opportunity to see Tom Hanks do comedy. Los Angeles is the city. Joe Friday works there. His longtime partner suddenly retired, Friday’s by-the-book, straight-laced sensibilities are offended by his new partner: free-form, haphazard rookie Pep Streebeck. Their first case together concerns a spree of crime perpetrated by the card-dropping group P.A.G.A.N. : a fruit bat, anaconda, and lion’s mane from the zoo, a pair of chemicals that create a poisonous fertilizer, and the entire run of the latest “BAIT” skin magazine. The investigation leads them to an attempted virgin sacrifice and ultimately to the most untouchable man in town. It’s hard to do sustained parody, epecially without resorting to farce. Aside from the opening and closing sequences, this is a standard opposite cops comedy with the Dragnet theme occasionally. That’s not to say it’s not funny, it’s just that for most of the movie, the only way the humor touches the source material is Joe Friday playing an old-fashioned straight man finally acclimating to the 80s. Dan Ayckroyd is very reserved in this movie, which he’s done a lot. He seems to mostly do naive straight characters, with varying mixes on the naivete and the straightness, and Joe is streetwise-straight but worldly naive. His life, until the start of the story, is duty and jumping at the chance to rattle off a memorized law. Tom Hanks is the opposite, which is much easier to do, especially with a young man’s energy. Dabney Coleman and Christopher Plummer have supporting roles, with Plummer delivering a very good American accent and Coleman putting on this strange, implacable voice that I want to describe as Porky Pig minus stutter plus half a lisp. When not using the TV theme (which is mostly absent), the music is entirely 80s style. Most of the time this is good, but the opening and closing titles gave me pause. I was taken aback by the “updated” Dragnet theme over the opening credits, layering in a synthesizer, drum machine, and sound bite voice clips, but I ultimately decided it was harmless and a fun modernization. However, as the closing credits begin to roll, Joe and Pep do an awful 80s mainstream non-threatening rap. Pep might come close to what the lyrics perpetrated, but even after character development, Joe wouldn’t be anywhere near as “fun” as his part in it. An interesting side note: this Joe Friday may act much like the Joe Friday of television, but he is in fact that Joe’s nephew. The elder Joe’s partner has made Captain as of the late 80s. This conceit, that it’s all happened before and is happening now, but differently, intrigues me. I can only name one other instance (the My Favorite Martian movie), but it seems more familiar than that. Star Trek got the same basic result by creating a parallel universe, but the “take two” aspect seems more common. I’ll be on the lookout for more examples in the future. This film is ultimately a fun romp with a nostalgic aspect its cousins in the genre don’t share. For pure parody, I’ll take The Naked Gun or Stan Freberg’s sketches, but as a cop movie comedy, I couldn’t ask for much more than this. Watch this movie: to protect and serve your fun evening. Don’t watch this movie: for the Dragnet you knew.